You can download a trial version of the AcustiX Soundtrack Winds. Most woodwind libraries require endless tuning and tweaking of wind sections, losing focus on playability. AcustiX Sountrack Winds takes a different approach. All woodwind sections are carefully layed out and blended over the full range of the keyboard. This makes the woodwind sections playable as one instrument from the contra-bassoons and bassoons to the oboes, flutes and piccolos. Most libraries have different patches for legato, staccato and marcato/portato winds and these patches can't be easily stacked to create one playable instrument. They use either the key-velocity or the cc-controller to modulate the volume dynamics of the winds, making it impossible to play both legato and staccato at the same time. With AcustiX Soundtrack Winds you can combine/stack the legato and staccato winds patches without keyswitching, allowing a different and unique approach in playability. The key-velocity is used to modulate the attack dynamics (staccato/marcato), while the mod wheel (cc-controller) is used to modulate the volume dynamics (piano/forte). This allows for any combination of legato/staccato/marcato at the same time. Although it is still possible to use the legato or staccato/marcato patches separately when needed. This allows both a lush and lyrical warm legato sound in the piano parts and a heroic and dramatic sound in the fortes. This character makes the AcustiX Soundtrack Winds perfectly suited for classical and soundtrack music. 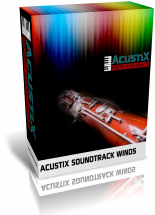 The AcustiX Soundtrack Winds is currently available in Kontakt format. To be able to use the strings, you need Kontakt 5 from Native Instruments. As with all AcustiX instruments, the focus is on compactness and playability. You can download a trial version (6MB) of the AcustiX Soundtrack Winds. Only Legato patch, no Staccato/Marcato patch. Only one velocity layer was used. Mod Wheel (CC controller) controls legato volume dynamics. Total size less than 6MB. Despite these limitations, you will appreciate the quality of this trial version. It will give you an impression of what the full product has to offer.